ProTrainings was not created because there were too few CPR training classes. There are plenty of classroom options requiring 6-8 hours of your time. But these classes don’t deliver quality training on your schedule. They don’t allow you to train any time of day from the comfort of your own home. In 2003, the idea of learning CPR online seemed ambitious at best and far-fetched by most standards. YouTube did not even exist at the time. However, a frustrated marketplace filled with underserved consumers allowed ProTrainings to thrive. A few years later, with the help of technology advancements, an enhanced internet, and e-learning becoming more understood, everything changed for ProTrainings and online CPR training. Fast forward to today. With e-commerce booming and e-learning becoming more and more prevalent, the idea of online CPR training is no longer far-fetched. It is embraced. Now, all major CPR providers offer online CPR certification. With the trend towards online CPR training, it is important to understand the pros of online CPR as well as the cons. This will help you make an informed decision of what style of training works best for you — online, blended, or classroom. To help with that decision, it’s important to understand how it’s possible to get CPR certified online. How Does Online CPR Training Work? Quality online training programs typically include recorded video lectures taught by a passionate instructor, practice questions to help you learn the material and test your knowledge along the way, a downloadable student manual, and a certification test in a multiple choice format. Once you complete the course, you’ll receive a digital certification immediately. For most students, 100% online training is acceptable. However, there are certain industries and professions where hands-on skill practice is mandatory. This is where the blended format bridges the gap by adding a hands-on skill evaluation. The skill evaluation is typically accomplished with a live video conference, but some students elect to meet with a local skill evaluator. Now that you know how online training works, let’s take a look at why you may or may not choose to get CPR certified online. Whether you have landed your dream job, are opening your own business, advancing your education, or meeting school or occupational requirements, it’s time to become CPR certified. To answer your questions regarding the various options, let’s review the pros and cons of each of the three main learning formats. Self-Paced: Online CPR training is self-paced. This allows you to stop and start your training and testing at any time. Need to go over the previous lesson again? No problem. Want to pause to take additional notes? That’s okay! It’s up to you whether to take the training in one sitting or break it into multiple sessions as needed. You can tailor it to your learning style. Convenient: Whether you are a morning or night person, you can access the training whenever your busy schedule allows. The instructor is always available and at their best. Digital Certification: You can access your certification card and training materials at any time! Misplaced your card? That’s no longer an issue. Just log in and print it out. Need a refresher? The training video library is always just a click away. No Skill Evaluation: Certain industries and professions are required to have a hands-on skill evaluation, which 100% online training does not include. It is important to check beforehand to be sure you can do online training. However, in most instances it is possible to add a hands-on skill evaluation at the end if you find out you need it. Structure: Classroom training provides an environment where you have no choice but to do the training. This can help those who require extra motivation and discipline to complete their training. Questions: In a classroom setting, you are able to ask questions directly to the instructor, but at risk of disrupting the flow of the class. Skill Evaluation: You will be able to demonstrate your skills on a manikin, however this may be in front of the entire class. Inflexible: The date and time are set and you will need to work your schedule around attending the class. 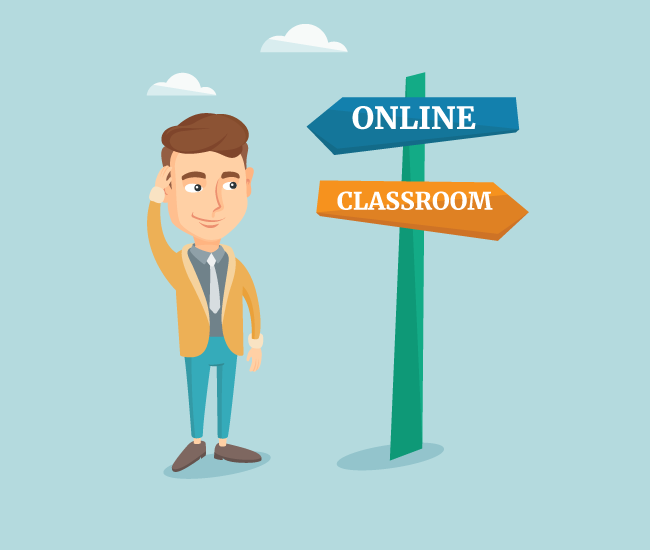 Blended training is a balance between online and classroom training. Once you complete the course online, you will follow it up with a hands-on skill evaluation. While it’s not quite as convenient as online CPR training, it is typically more convenient than the classroom. The addition of the skill evaluation generally only takes 45-60 minutes to complete. While it is more expensive with the hands-on training, it is great for those who want to take online CPR training but need a hands-on skill evaluation for compliance purposes. Is Online Training Right For Me? Do I need a hands-on skill evaluation? The most important question for you to answer is whether your industry, employer, school, etc. requires a hands-on skill evaluation. How does completing my CPR certification fit into my life? The convenience of online courses benefits many people — whether you’re a nurse working nights and weekends, a student with a non-traditional schedule, a construction worker putting in long days, or a parent who wants to learn CPR. It’s important to figure out how to fit CPR training into your life and online training may be the solution. Does online CPR training fit my learning style? Online training adds the benefit of learning the material at a pace that works for you. It allows you to review the training and practice what you have learned on your own terms. It can also be helpful for those that have anxiety in a classroom or educational setting. Does the course follow OSHA guidelines? Does it meet the latest national CPR guidelines published by ECC/ILCOR and American Heart Association? Am I able to contact a compliance department? Am I able to preview or sample the training program? Before making a final decision, it’s always nice to know what you are getting into before making a purchase. Can I view the video training before purchasing? Is the instructor knowledgeable and engaging? How is the testing administered? How much is it and what does that include? Price can be a differentiating factor, so it’s important to know what is included in that price. Do I receive a certification card? Will I have access to my certification records online? Does this include customer support? Is support easy to contact? What happens if it’s not accepted– is there a money back guarantee? Can they help me find a hands-on evaluator? So there you have it. CPR training, like many other industries, is trending towards online. Obtaining your CPR certification is an important investment, so make sure you select the medium that works best for you. If you are still unsure and would like to preview an online training program, try ProCPR from ProTrainings at no charge and see if it’s a fit for you. My sister is considering working as a lifeguard later on when summer hits, and I think that online CPR training would be a great option for her to get certified before she applies. She’s rather busy with school and other activities, as you said, and so being able to get the training done in a way that happens on her own schedule would definitely be a great benefit to her. She’s definitely much better with reading than listening to lectures, as well, so it would really fit her learning style, as you mentioned.